Provides advanced cleaning and whitening results. Polishing cup whitens teeth starting from day 1 by removing surface stains. Bristles clean on and around teeth to help remove plaque. Compatible with the entire line-up of Oral-B rechargeable electric toothbrushes, except for Oral-B sonic toothbrushes. 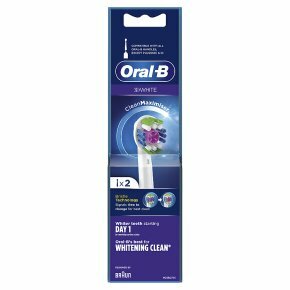 Oral-B #1 brand used by dentists worldwide.Inspired by professional dental tools, the 3DWhite power toothbrush head is designed to clean tooth-by-tooth and is ideal for advanced cleaning and whitening. The specialized bristles sweep away plaque and the polishing cup whitens teeth starting from day 1 by removing surface stains. Refill pack - 2 count.